A British homophobic neo-Nazi terrorist is to face sentencing over plans for an attack on a pub’s gay pride night. Ethan Stables was caught with a multitude of blades including a machete, which he planned to use in the attack. Stables, then aged 20, was arrested by armed police as he made what prosecutors described as a final reconnaissance visit last summer to the New Empire pub in his home town of Barrow-in-Furness, Cumbria. Following his arrest on June 23, 2017, police discovered the machete, as well as an axe and knives that he kept at his home. Stables had revealed his intent on social media posts to far-right pages. 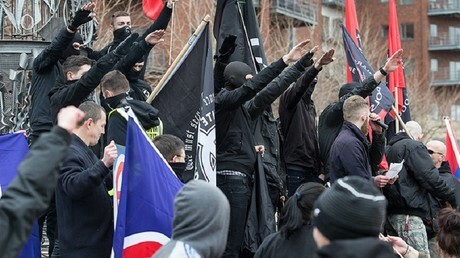 He said he was “going to war” and wanted to “slaughter every single one of the gay b******s.” Officers were tipped off about the impending attack by another member of one of Stable’s far-right groups. Stables was tried at Leeds Crown Court, convicted of preparing an act of terrorism, making threats to kill, and possessing an explosive substance in suspicious circumstances. It was also revealed that he had researched firearms and bomb making. Following his conviction on February 8, his barrister, Patrick Upward QC, told the Recorder of Leeds, Judge Peter Collier QC, that Stables lived in “almost squalid conditions” and led a “melancholy life” up to the day of his arrest. Upward also said that his client “bears no comparison with the men who attacked Corporal (Lee) Rigby,” and that he did not have the “wherewithal” to follow through on the plan. British Army soldier Lee Rigby of the Royal Regiment of Fusiliers, was attacked and killed by Michael Adebolajo and Michael Adebowale in 2013 near the Royal Artillery Barracks in southeast London. Prosecutor Jonathan Sandiford pushed back on Upward’s comments, telling the judge that Stables had intended to attack multiple people. He also said that Stables had investigated a number of ways to launch an attack. Stables will be sentenced at Leeds Crown Court by Judge Collier on Wednesday.